Here in North Manchester the rain has been falling, on and off, for most of the past fortnight. Where we are the after-effects haven’t been anywhere near as bad as the horrendous conditions that have caused flooding up in Cumbria, or down the road in Salford, but still: weather has stopped play and not much has been happening down on the allotment as a result. 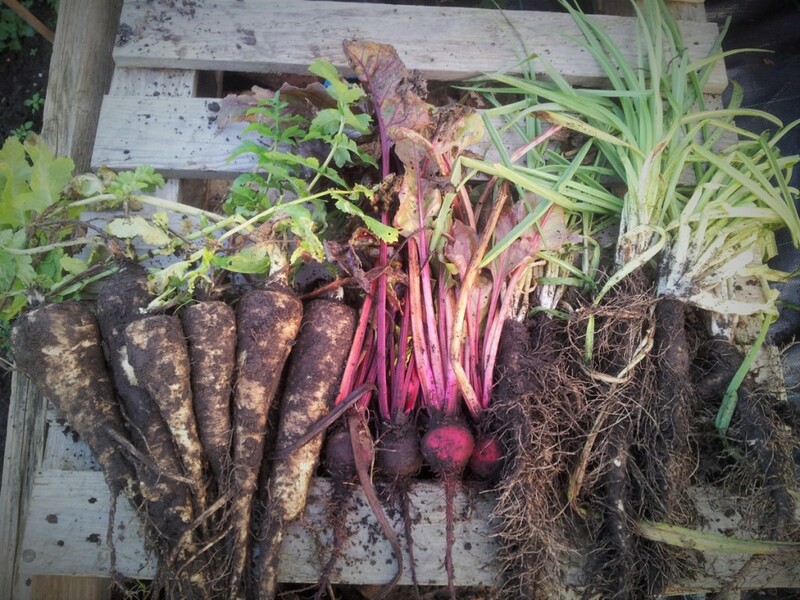 I did manage to harvest a few roots for our Christmas dinner roasting tin – parsnips, beetroot and salsify – but that’s pretty much it. Roots! Parsnip, beetroot and salsify for Christmas dinner. A couple of weeks before Christmas, I made a list of the jobs that need doing before the next growing season kicks in. Most of them involve digging and clearing perennial weeds from the sections of the plot that we haven’t properly tackled just yet. Either that or surface-weeding the sections that we cultivated last year. Of course when the ground is wet, even if it isn’t actually water-logged per se, it’s often advisable to leave well alone. Digging wet soil can damage the structure by compacting rather than breaking it up and aerating. Even weeding can be problematic, with great clumps of soil coming away with the weed roots and ending up in the rubbish bag, rather than crumbling back down to the ground. For now, Jo and I will continue to watch the weather forecast and crack on with a few seasonal admin jobs: cleaning tools and containers, sorting seed packets, tidying up the piles of junk in the shed and separating the useful from the recyclable. Hopefully it won’t be too long now before we can get back on with the digging and clearing, and of course a spot of early seed-sowing, too.